A full colour map of the Grand Union Canal from Birmingham to Milton Keynes suitable for both waterways and leisure users. 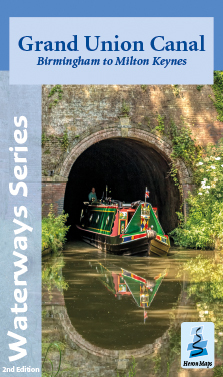 This map gives detailed coverage of the Grand Union Canal from Birmingham to Milton Keynes with emphasis on the waterways and information useful and relevant to users of the waterways without neglecting other leisure users. The map detail is complimented by information panels and photographs. The Grand Union Canal is Britain's longest canal, running 137 miles from London to Birmingham. This map covers the western end from Birmingham to Milton Keynes, a largely rural and peaceful route through Warwickshire and Northamptonshire. It includes the Northampton Arm and start of the Leicester Line. A route that starts in the very heart of Birmingham, heading out through the suburbs before turning south towards historic Warwick and the Georgian edifices of Royal Leamington Spa. Onwards to Braunston, Weedon Bec, Blisworth and Stoke Bruerne and its canal museum, before arriving in Milton Keynes. Much of the route through the city hidden by the greenery of parklands. This tourist map is at 1:50000 scale with an enlarged plan of Birmingham at 1:30000 and detailed town plans of Warwick, Braunston, Weedon Bec, Stoke Bruerne at 1:12500 as well as Kingswood and the Lapworth Link to the Stratford-upon-Avon Canal. An additional plan of the heart of Birmingham at 1:10000 is included, as is the Grand Union Canal Walk, Britain's first national waterways walk. The Grand Union Canal, Birmingham to Milton Keynes map is available to buy online or by telephone from our business partner, Guidepost. Click on the logo below to visit their store.